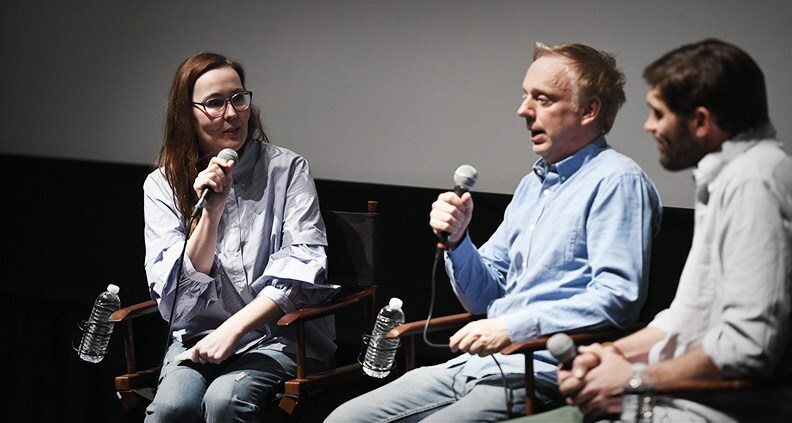 Week two of Film Independent’s 2018 Directors Close-Up series began with the introduction of acclaimed screenwriter (and sometime director) Mike White, the man behind the scripts for Chuck & Buck, School of Rock and this year’s Beatriz at Dinner, among many others. 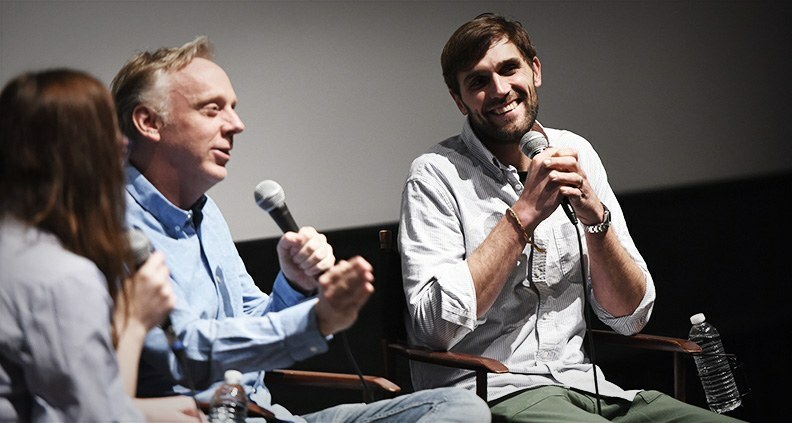 Joining White at the February 14 event—titled “Storytellers: Writers and Directors”—was a relative newcomer: David Branson Smith, co-writer (with Matt Spicer) of 2017’s Ingrid Goes West. Beatriz and Ingrid are both currently nominated for multiple 2018 Film Independent Spirit Awards, including individual nominations for White and Smith for Best Screenplay and Best First Screenplay, respectively. White has already won twice, claiming the John Cassavetes award in 2001 for Chuck & Buck and Best Screenplay in 2001 for The Good Girl, both directed by Miguel Arteta, also the director of Beatriz. Talk about a fruitful collaboration! 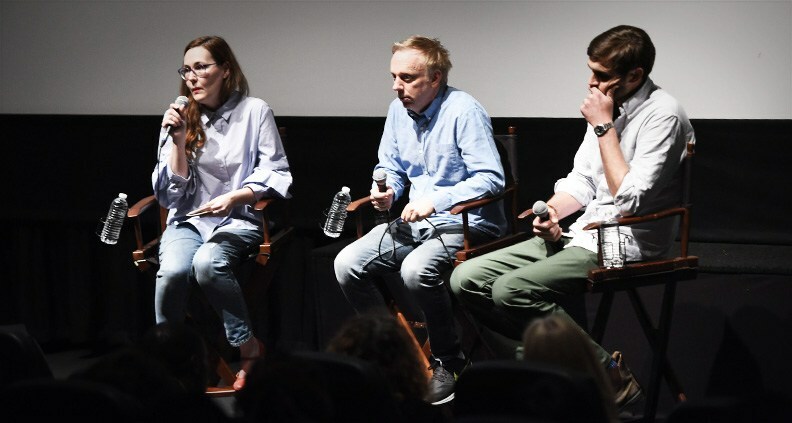 Ingrid Goes West was the Closing Night Film at the 2017 LA Film Festival and Michael Arteta was the Festival’s Guest Director, so it made perfect sense for Jennifer Cochis, Director of LA Film Festival to moderate the discussion. Topics encompassed what a typical day is like in the life of a working writer, facing rejection, working with theme and letting work pass on to a director. Pointer number one from White: don’t believe the hype. Instead of trying to land that fancy meeting or industry lunch, instead use this time to write. “You should be spending that time building a body of work and trying to satisfy yourself,” he said. “The beauty of being a writer is that you don’t need someone to ask you to do it, you can just go do it.” If you’ve written a great script (or scripts!) this is way better than scoring yet another dead-end networking lunch—so good on you. For Smith, though, it was a little different. “I got to a point with my scripts, even though they were just getting me into rooms and weren’t selling, that the rejection felt mitigated by a sense that I was advancing as a writer,” he said. White stressed the importance of confidence. “You’re trying to get people to believe in your weird dream. It’s about ‘I’m going to win!’ You have to have a little bit of that attitude,” he said. Smith said that he worked extensively with a writing partner when first starting out in the business, and they were heartbroken after not getting job after job. “It was constantly [like] ‘what’s the next Pineapple Express?’ There’s definitely a sense of pressure to conform and to chase the ball rather than control your career.” Control is key, and so is work ethic. White, dispensing sage advice for writers. White, however, prefers the writer’s life. “I’m not somebody who thinks, ‘I’ve got to get back on the set,’” he said. “If a situation presents itself, like ‘these are cool people, this could be fun,’ I’ll throw my hat in the ring as a director.” Otherwise, what White really enjoys is walking to grab coffee and writing on his own terms. “I can only [write] when I have a good routine,” said Smith. “Whether that’s going to the same coffee shop every morning, or going in the ocean every day until I’ve finished because I needed to discipline myself.” Six months is usually Smith’s deadline for completing a script. Finally, audiences’ tastes are always changing and evolving. So forget trying to make a character more “likable” and write the truth as you see it, even if it’s a bit ugly. That’s what White and Smith did, and it worked! To learn more about the 2018 Film Independent Spirit Awards—happening March 3 with returning hosts Nick Kroll and John Mulaney—click here. The 2018 Directors Close-Up is sponsored by Premier Sponsors DECENT, Directors Guild of America, Landmark Theatres and SAGindie and Principal Sponsors Citi and USA Network.